Hydroblast were recently contracted to seal off the now closed Kellingley Colliery. This was the last deep coal mine in Britain – located in Beal North Yorkshire. The pit finally closed in December 2015 after 40 years of coal production and was the end of deep pit coal mining in Britain. Following this the Hydroblast team began work using the cutting edge AquaCutter technology from AquaJet to begin preparing for sealing the pit. Kellingley Colliery had two main shafts that went around 800m deep – one for transporting men and materials and the other for the extraction of coal from the Beeston seam – something which at its peak was done at a rate of 900 tonnes an hour. The coal produced here was used in local power stations however it was also producing household quality coal. Using the advanced AquaCutter 410A Evolution, Hydroblast – Yorkshire’s only Hydrodemolition company began to prepare the shafts for sealing. 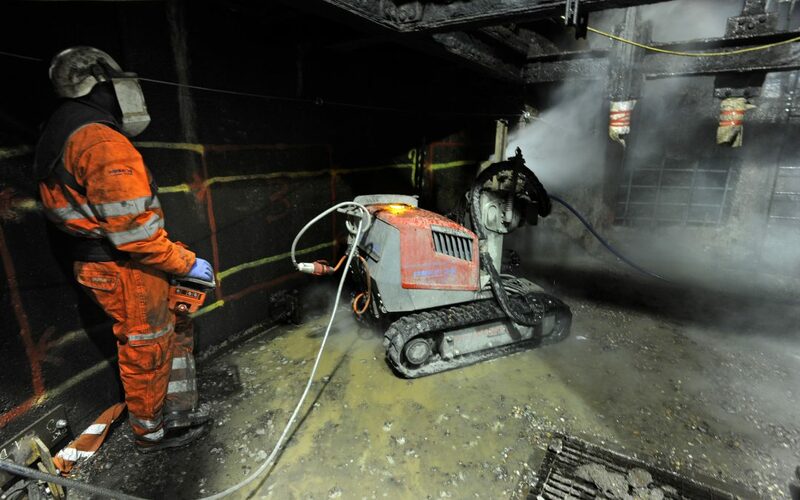 This is done by blasting the pit shaft walls with high pressure water ( 1000 bar pressure and 260 litres per minute). Water jets and Hydrodemolition are used here, because standard drilling will do damage to the steel bars used to reinforce the concrete of the shaft. Once Hydroblast have finished their part of the process, then additional concrete will be added into these holes for the purposes of strengthening them, then the remaining buildings of the surface complex will be demolished in order to allow for redevelopment of the site. So Why Use Equipment Like The AquaCutter 410A Evolution and Hydrodemolition? 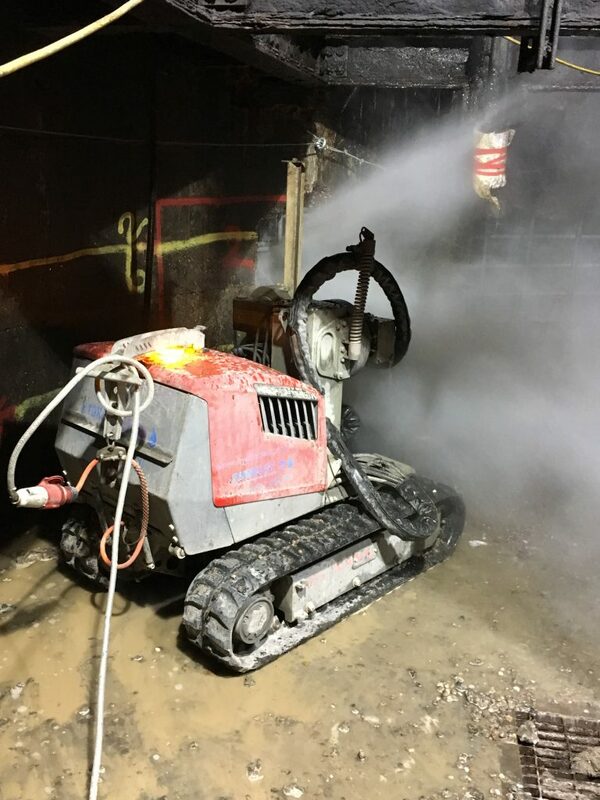 As mentioned preciously, this process needed the AquaCutter 410A Evolution as a key tool, as using traditional demolition machinery and practices, such as drilling would have run the risk of doing damage to the steel that reinforced the shafts – therefore Hydrodemolition was the right call. The AquaCutter 410A Evolution that we recently acquired became our only option for carrying out this work, due to the versatility of the machine. The spaces that we were working in were confined due to being a small space and there being reinforcing steel beams. Alongside the constraints of the environment, time was a key factor as Hydroblast needed to cut 20 holes before March 2016, in order for the capping of the shafts to be completed. Initially work was attempted with a different machine from a different manufacturer, however it was discovered that although the high pressure water jet would get to 50mm of a hole, when we required going 600mm. Therefore the original machinery was not up to scratch for the task and we had to bring in the AquaCutter 410A Evolution. We needed more power, so we employed our 700 Horse Power machine which drives a 1000bar pump at 260 litre/minute, giving an amazing 1.9 tonnes of breakout “reaction force”. This job required such force and pressure, to be provided in a safe way, hence the need for Hydroblast to use their expertise, Water Jetting Association approved practises and the AquaCutter 410A Evolution which is the first of its kind in Britain. Once the mine shafts have been capped off, and UK coal added 2 metres of concrete, then the shafts can be used for the harvesting of methane gas which can be used to produce electricity.